"My daughter renamed this recipe 'The Best Dessert I've Ever Eaten' this summer when I prepared it for Memorial Day. I had made it before, but my husband had probably eaten all of it before she had a chance to get a taste! My husband doesn't like me to take this dessert to a large gathering because it means he won't have any leftovers! Got this recipe from a Bunco friend." 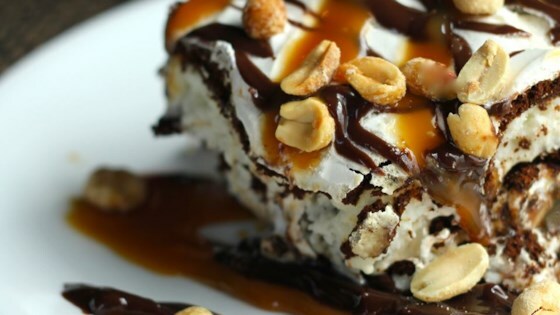 Arrange a layer of ice cream sandwiches in the bottom of a 9x13-inch dish; top with a layer of whipped topping, hot fudge topping, and caramel topping. Repeat layering with remaining ice cream sandwiches, whipped topping, hot fudge topping, and caramel topping, ending with a top layer of whipped topping. Sprinkle with pecans. Cover dish with aluminum foil and freeze until set, at least 30 minutes. instead of pecans, top with crushed Butterfinger candy bar.....amazing. Kids love this! It's less sinful with Skinny Cow ice cream bars, fat free cool whip, and low fat chocolate fudge sauce. Butterfinger or whatever decadent bar on top, of course!